More than 31,000 Americans have signed a petition calling for British TV host Piers Morgan to be deported. They are angry about his advocacy of gun control, in the wake of the 14 December shootings in Connecticut. 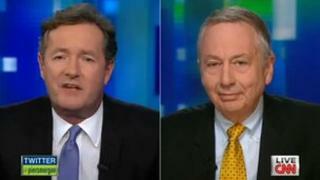 The petition followed an interview with Larry Pratt, director of Gun Owners of America, on CNN - in which Mr Morgan called his guest "a dangerous man". Petitions posted on the White House website only require 25,000 signatures to get a response from the government. The campaign was started by a journalist in Texas following Mr Morgan's CNN programme of 19 December. The petition says the talk show host "is engaged in a hostile attack against the US Constitution by targeting the Second Amendment", which protects an individual's right to own guns. "We demand that Mr Morgan be deported immediately for his effort to undermine the Bill of Rights and for exploiting his position as a national network television host to stage attacks against the rights of American citizens." Mr Morgan has responded, repeatedly, on his Twitter account. "If I do get deported from America for wanting fewer gun murders, are there any other countries that will have me?" the 47-year-old joked after the 25,000-signature threshold was passed. He added: "Wanting America to ban assault weapons and high-capacity magazines isn't anti-constitutional - it's called 'common sense.'" Later he said, in a reference to the Constitution's guarantee of freedom of speech: "Ironic US gun rights campaign to deport me for 'attacking Second Amendment rights' - is my opinion not protected under 1st Amendment rights?" In the wake of the shooting in Newtown, Connecticut, President Obama has vowed to push for immediate and concrete gun safety proposals. But the pro-gun National Rifle Association (NRA), which has more than four million members, has rejected the need for tighter gun control. According to the Small Arms Survey, there were 88.8 firearms for every 100 Americans in 2007. Mr Morgan's interview, on his nightly chat show, came five days after gunman Adam Lanza killed 20 children and six adults at Sandy Hook Elementary school. Mr Pratt said tighter controls on gun sales would not put an end to similar tragedies. "The problem occurs in those areas precisely where we have said 'no guns'," he said. "Where the guns are allowed freely to be carried... we have very low murder rates. "We only have problems in our cities and, unhappily, in our schools, where people like you have been able to get laws put on the books that keep people from being able to defend themselves." Mr Morgan responded: "You're a very stupid man, aren't you? "You have absolutely no coherent argument. You don't actually give a damn about the gun murder rate in America." He ended the combative interview by calling Mr Pratt "a dangerous man espousing dangerous nonsense" and declared, "you shame your country".